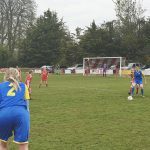 This Women’s Championship match at Quorn FC was only the third match I had been able to make this season, but it was well worth the effort of travelling down from Nottingham and I wanted to write something for Since’71 about this. 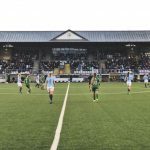 In particular, I wanted to put myself into the thinking of someone who had either not seen women’s football before at all, or who had been to see the Super League, but was wondering whether a Championship match could justify the time and effort involved. 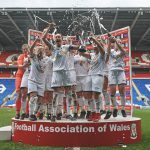 My opinion is that they would be well rewarded to go and see the Championship in action, and I wish they would because larger crowds could be the best means of attracting more money and sponsorship into women’s football. 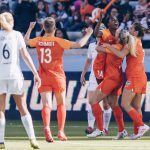 Although this will have been written elsewhere by many committed supporters of women’s sports, I wanted to add my opinion to theirs. 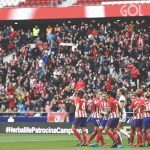 I feel bad now that I can’t mention all the players in this sitting, but I would need more matches to get to know these clubs better. On the way down to Leicester, I was just wondering what had happened to Ella Franklin, another Oxford Utd alumna who used to run their attack sometimes and always showed wonderful close control of the ball and accurate passing. I needn’t have worried, she is on Leicester’s books and started at right-back in this match, cleverly turning defence into attack, which the top players make look easy, but isn’t. In the second half, Leicester moved Ella to attacking midfield, which I used to think was her natural position but she did just fine at right-back against some powerful attacking by Sheffield in the first half. 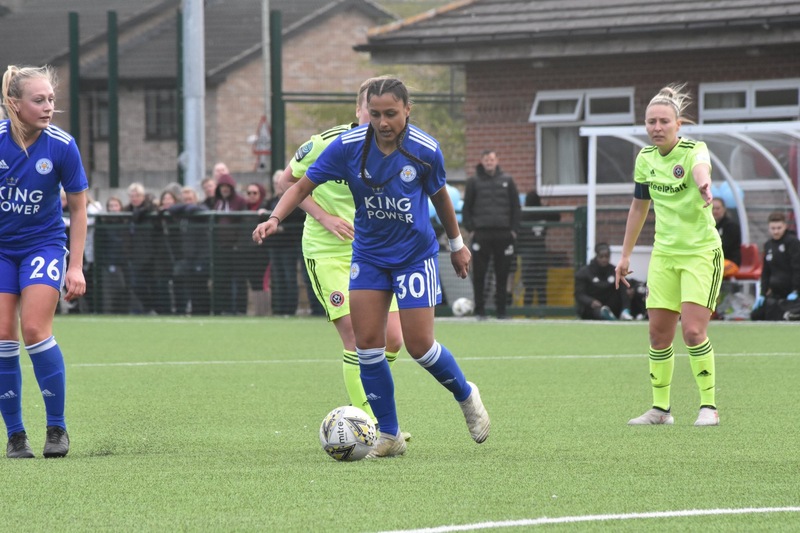 One match is not enough to comment on a whole squad, but after a single viewing I could say I really enjoyed Simran Jhamat’s endeavours up front for Leicester, and Hayley James’ input after she subbed on in the second half. Not only did she score for Leicester from a set piece, her throw-ins were really strong and I can’t help but feel she would already be attracting attention on the back pages of our newspapers, had she been born male. If I went to see Leicester again, I would definitely hope to see Fiona Worts, who hit such powerful* shots past Demi Lambourne in the warm-up that I thought we must surely see her on at some point, perhaps after her team went 1-2 down in the second half (a score which I thought was fair reward for Sheffield’s determination and creativity in attack, as well as their defence as a team which meant GK Fran Bentley was seldom called into urgent action). *By “powerful shots”, I don’t just mean they went in, I mean literally tomahawk: GK’s presence irrelevant. As for Sheffield United, I would urge any fan of football to go and see them. 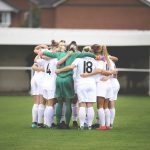 I remember Carla Ward managing Sheffield FC in 2016 when I used to see them play in Dronfield, and at that time there was no doubt for me that she had the team closely organised in defence, and confident enough in attack to pose serious questions of any opposition in what was then WSL2. In attack, Ebony Salmon is another loanee from Manchester United with great potential. 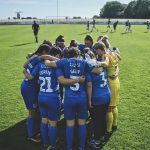 She crashed a shot against Demi Lambourne’s post in the second half and she was generally a livewire throughout, as Sheffield say in their own match report. I remembered Ellie Gilliatt from her time at Sheffield FC and in this match she was worth the gate all on her own, leading by both example and spoken instruction. She equalised for her team in the second half by hitting something out of Star Wars past Demi Lambourne. 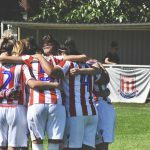 Sheffield’s full match report can be found here: www.sufc.co.uk/women/news/2019/march/womens-leicester-report. While there would be no purpose me repeating it all here, I would say that as someone who has not been able to see as many matches in the FAWC this season as he would have liked, including games involving either of these two clubs, I saw more than enough in this match at Quorn FC to make me want to go again to see them in action. I also remembered Dan Cox from her time at Sheffield FC and Maddy Cusack from when she was at Villa. 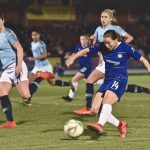 I was going to say that neither of those players usually makes the headlines, but their contribution to ball-winning in particular is not in doubt, except that Maddy Cusack has just made the nomination list for FAWC Player of the Month for March. This is a fine achievement for a player whose industry and strength in midfield usually escape people’s attention, unless they go to watch the matches and then these qualities will be evident.